Love in the Smoky Mountains – the center of it all is the wedding, and here’s everything you need to know about getting married in the Gatlinburg and Pigeon Forge area. It’s February in the Smoky Mountains and this is a popular month to get married. May and June are the busiest time of all – now, could it be that’s because somebody proposed back on Valentine’s Day? And maybe the couple will come back to their same romantic getaway cabin for a honeymoon? Well, it easily could be. Love goes around and around in Gatlinburg and Pigeon Forge, between engagements, weddings, honeymoons, anniversaries and vow renewals – people fall in love with the Smoky Mountains too, and return again and again. See our latest article: Valentine’s Day 2016: Love in the Smoky Mountains. Weddings are a lot of work, and the Gatlinburg area is home to many services and workers devoted to making it easier for bride, groom and families to arrange. More affordable too. Check our interview with Julie Witt of Carles-Witt Events, our recommended wedding planners: Carles-Witt Events: Wedding Planners and More. TIP: you can always call us 24/7 at 855-91-SMOKY and let our friendly front desk staff answer any questions you may have. Julie says coming to the Smoky Mountains for your wedding can actually be a cost-saving move. Staying in your own town tends to obligate you to inviting more people than you might have wished. But a stay in some mountain cabins enables you to limit the size of the guest list. Also, says Julie, if budget is a concern with your wedding, this is exactly when you need a planner – it’s cheaper than going it alone. Be sure to check her Ninja Budget Math in our article to see how this works. Did you know there are so many wedding chapels in the Gatlinburg and Pigeon Forge area that it ranks second only to Las Vegas? It’s true, and Gatlinburg is one of the most popular places in the entire world to get married. So yes, you can get married here. Marriage licenses are available with no waiting period and no blood test required. People do get married on the spur of the moment, and there’s even a drive-thru wedding service for people who are racing towards the rest of their lives together. Marriage at Gatlinburg Falls? There’s a package for it. We make it simple with a choice of wedding ceremony ranging from the very simple to the very grand. 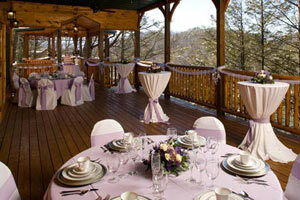 See our Weddings in Gatlinburg page for details. At the time of writing, for just $125 you can get married in your very own cabin – and suddenly you’re on your honeymoon. Larger ceremonies start at $515, plus cabin rental. This provides cake, bouquet, music and a photographer, all in our lovely wedding facility, which feels like a large lodge in the mountains. Ceremonies range up to around $2,000. And for the all-important reception, we have several options for you and up to 125 guests, with a large dance floor. See our Wedding Reception page to discover what kind of celebration is best for your special day. In our weddings pages you’ll find all the resources you need to help you get married in Gatlinburg and Pigeon Forge. Also, we offer many different packages with our cabin rental for occasions such as vacation, romance and wedding. See Cabin Deals & Packages. And remember that you can always create your own package to custom fit your stay: Create Your Own Smoky Mountain Package. Cabin rental comes with privileges, and our $400 Trip Cash book of coupons to local attractions may help you choose where to go: Gatlinburg & Pigeon Forge Coupons. And finally, what’s the best way to find the perfect Gatlinburg honeymoon cabin? We have that covered in our article full of tips to help you choose in advance: How to Find Your Perfect Cabin in the Smoky Mountains. Also, you’ll find more on the special deals and discounts that come available at short notice, and how to make the best of them in our companion article: The Perfect Cabin – Getting the Best Value.